To simplify, replace the fondant potatoes with boiled baby potatoes, and use frozen peas and broadbeans with butter for your veg. 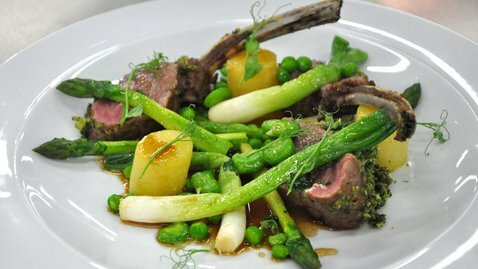 1 rack of lamb (8 bones) – Ask your butcher to French trim, removing most of the fat. Cut the rack in half. Season and cover in sunflower oil and brown well on all sides. Set aside. Blitz parsley, basil, thyme, rosemary, ½ clove garlic with breadcrumbs to form a bright green crust. Add a little oil if necessary. Lightly coat each rack of lamb with ¼ tbsp of Dijon mustard. Roll the top of the lamb in the herb mixture and place on a baking tray. Cut 3 cylinders out of the rooster potatoes using a scone cutter. In a saucepan, place 50g butter, clove garlic (lightly crushed), 2 sprigs thyme, sprig rosemary and heat well on medium temp until the butter is foaming. Ensure the butter does not burn. Add the potatoes and cook until golden brown on all sides. This may take 15-20 minutes. Add 50ml white chicken stock to stop the butter burning. Place the saucepan on the same tray as the lamb and place in the oven until lamb is cooked to 50⁰ C or medium rare. Will take approx. 10-15 mins depending on how long the lamb was sitting on the table. Chop the shallot roughly and brown in a saucepan with a little oil, clove garlic, thyme and rosemary. Once browned, add a knob of butter and remove from the heat. Once melted, return to the heat and de-glaze the pan with a splash of sherry vinegar. Add 50 ml of madeira wine and reduce by half. Add 100ml of brown chicken stock and reduce by half until it is the required consistency. Strain through a sieve and set aside in a fresh saucepan and keep warm. Lamb should be cooked at this stage and have rested for 5 – 10 mins. Place on a chopping board along with the potatoes. Cut each rack in half. To serve, arrange the potatoes and half the asparagus/spring onions on the plate. Place the lamb resting against the potatoes. Add a sprinkle of salt to the meat, the remaining vegetables and finish off with the madeira jus and some pea shoots.